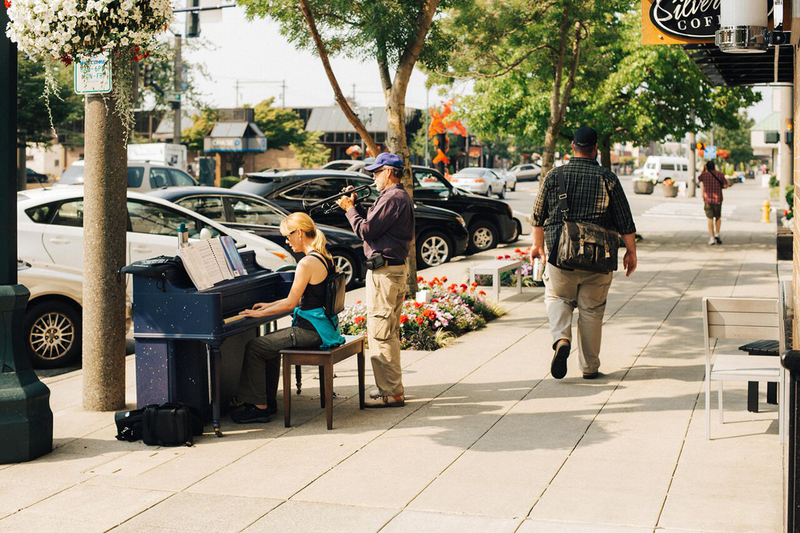 Colorful pianos positioned along the sidewalks in downtown Everett spur impromptu street performances. Photo by Jake Campbell. A great afternoon of shopping, lunching and browsing is assured in the very walkable downtown Everett. Watch the assembly of the world's largest airplanes at the Boeing Tour on Paine Field. No place embodies the spirit of the Pacific Northwest better than Everett—airplanes, coastline, proximity to mountains. It’s the Northwest spirit—a little bit wild but in a good way. Not gritty—it’s eccentric and original. There’s no place like it." Everett’s economic and cultural heritage lie in the lumber, aerospace and maritime industries. And they are still part of the town’s identity. Boeing employs 30,000 people at its Everett plant and thousands of visitors annually tour the Future of Flight Aviation Center and Boeing assembly plant. But in recent years, the most intriguing growth has been in the downtown core where new cafes, coffeeshops and galleries have opened. For visitors, there’s plenty to love, including eclectic vintage shops. Looking for good food, local beverages and a little culture? Independently owned spots in the 10-block downtown core include a coffee shop voted “the best in the world,” funky brewpubs, bottle shops and a wine tasting room, a café that makes the cinnamon roll of dreams, and the newly opened Farms & Market artisan food market. It’s getting harder and harder – but definitely worth the effort – to get tickets to performances at Village Theater, which features local talent in productions of classic and new musicals as well as comedies and drama. Don't tell the kids, but besides fun, they will actually learn a lot while exploring the wonders at Imagine Children's Museum. The Schack Art Center provides opportunities to watch artisans in action or become one. A performance of My Fair Lady at the Village Theatre is one of the many great musicals you can enjoy. The Schack Art Center is an admission-free visual art center where locals and visitors can discover their inner artists. Families can spend hours at the Imagine Children’s Museum, which engages children with playful learning. The museum’s new Rad Science program on Saturdays offers hands-on science and technology demonstrations. In the summertime, linger downtown for free outdoor live music almost every night of the week and free outdoor movies. Popular upcoming events highlight the community’s love of music and brews, including the Everett Music Initiative’s Fisherman Village Music Festival March 30-April 1. Check downtowneverett.com for an events schedule. From downtown, head to the water. Everett, which has the largest public marina on the West Coast, takes full advantage of its waterfront location on Port Gardner Bay. During the summer, there are free events here, too, including the seasonal Everett Farmers Market and live music. “It’s the world’s best outdoor dance floor,” Chism says. “There’s a band playing on the dock, people dancing, food trucks. It’s a beautiful, perfect summer evening.” From July through September, catch the free Jetty Island Ferry (donations encouraged) to 2-mile Jetty Island for an idyllic day relaxing on the sandy beach or exploring nature trails. It’s also a popular kiteboarding destination. Emory's on Silver Lake provides a wonderful waterfront dining experience. Dining on the deck is a must on a bright sunny summer day. Emory's is reputed to have the best Happy Hour in Snohomish County. You be the judge. Live music is a tradition at Emory's. Get out and support the great local musicians that frequent the lounge. Consider ending a perfect day in Everett at Emory’s on Silver Lake. The family-owned and operated lakefront restaurant originally opened in 1994, proving it’s not just the new kids that make Everett shine. Following a devastating fire and with the support of the community, Emory’s reopened with a beautiful Northwest Lodge-style building in 2010. They have a popular happy hour with an extensive wine list, great craft spirits and local beer. Special events include live music on weekends and comedy nights.